Berserkley 16. 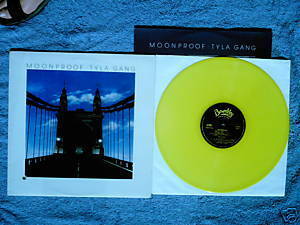 Tyla Gang Moonproof 1978 LP includes Suicide Jockey, Tropical Love, Oakland Red, It's Gonna Rain, Did You Hear It on the Radio, Rodeo. Produced by Matthew King Kaufman and Kenny Laguna.Vinyl and cover are VG with cutout hole in lower left corner; original insert with band photos.